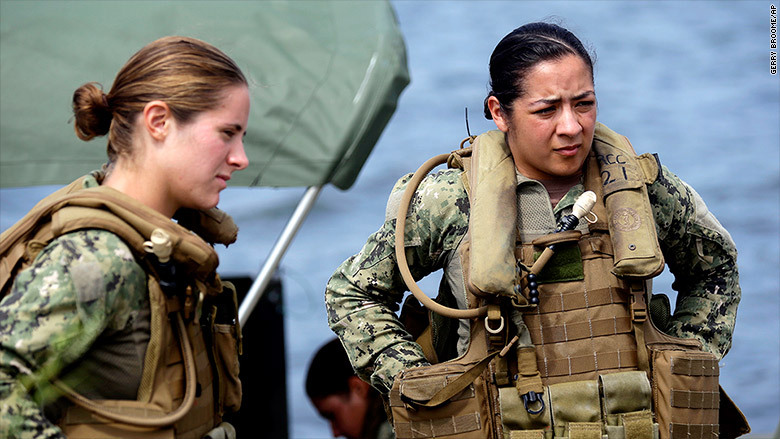 Good news for women serving in the U.S. Navy and Marine Corps. : They're now allowed to take 18 weeks of paid leave within one year of the birth of a child. The change triples the amount of paid leave that female sailors and Marines were allowed to take before. The reason for the increase is a desire to retain talented women who also want to have a family, said Navy Secretary Ray Mabus, who announced the change Thursday. "Meaningful maternity leave when it matters most is one of the best ways that we can support the women who serve our country," Mabus said. "This flexibility is an investment in our people and our services, and a safeguard against losing skilled service members." The new leave policy combines 6 weeks of paid maternity leave with 12 weeks of paid convalescent leave. The leave doesn't have to be taken all at once, but it must all be taken within a child's first year. The policy, effective immediately, will apply retroactively to any woman in the Navy or Marines who had a baby since Jan. 1, 2015. Men in the Navy aren't quite as fortunate. They are entitled to just 10 days' of paid paternity leave for the birth of a child. That time is codified in statute, meaning if Mabus wished to increase it he would need Congressional approval to do so. Out of the more than 200,000 active-duty women in the U.S. military, 57,300 are in the Navy and 14,100 in the Marine Corps, according to the Defense Department.